Aromas of black cherry and plum. Rich fruit on the palate with approachable tannins provide a long, smooth finish. This cabernet consists of 80% Cabernet Sauvignon, 7% Petite Sirah, 6% Merlot, 4% Barbera, 3% Petite Verdot. Each lot of wine was aged separately for 14 months in a combination of American, French, Eastern European and neutral oak barrels. A great California cabernet full of dark plum and cherry with nice oak influence that doesn’t become overpowering. 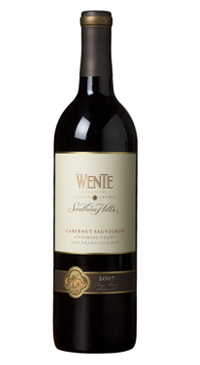 The Wente family has been making wine since 1883, so they have had lots of time to perfect their craft!